Being Frugal and Making It Work: 20 Mule Team Borax (Review and Giveaway) - 3 Winners! For scratch-free cleaning of stains, grime, and grease throughout the kitchen, use a 1/2 cup of 20 Mule Team Borax dissolved in one gallon of hot water on sinks, counter tops, cookware, refrigerators, microwaves, toasters, and any other appliance in your arsenal. Pets: Bathroom: Sprinkle 20 Mule Team Borax on a damp sponge or cloth and wipe on shower stalls, tubs, walls, and tile to remove soap scum, hard water deposits, and dirt. Carpet: Use a 1/2 cup of 20 Mule Team Borax per gallon of water in carpet steam cleaning machines. 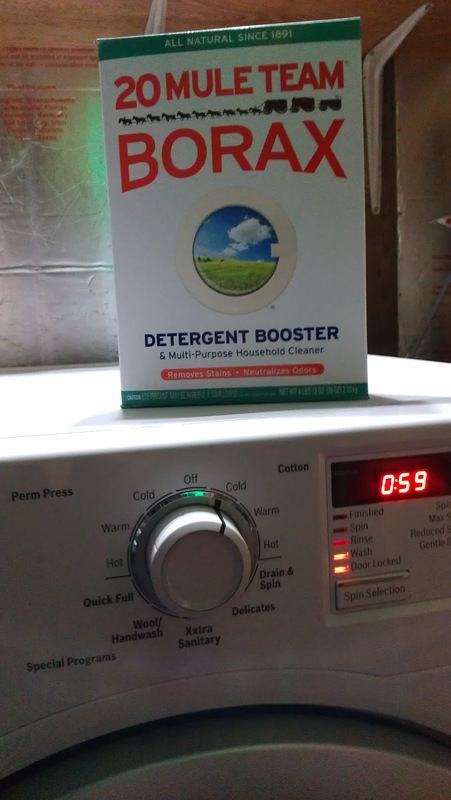 Borax is a 100%, all-natural laundry detergent booster. Absolutely nothing is added. No phosphates, per-oxside, chlorine, or other harsh chemicals. This giveaway will end January 31st at Midnight EST. Disclaimer: I received complimentary Borax laundry detergent booster as a Purex Insider for the purpose of writing a review and hosting a giveaway. Regardless, I only recommend products or services I use personally and/or believe will be a good fit for my readers. The views and opinions expressed on this blog are purely my own. Results may vary. No monetary compensation was received. Cleaning dishes is my least favorite! I hate dishes, but thankfully my husband usually does them. I hate washing dishes more than anything else! I hate cleaning the litter box and cleaning out the refrigerator! I don't know why I despise the second one so much...but I really do. And it shows. I don't like vaccuming the floors.. nonstop chore! thanks for the giveaway!